The Intergovernmental Panel on Climate Change (IPCC) is under pressure to revisit its projections of the expected amount of sea level rise by the year 2100. Many rather influential types are pushing for the IPCC to dramatically increase its central estimate by some 2-3 times above the value given in the IPCC’s Fourth Assessment Report (AR4). Nature speaks with a contrary voice, political agendas aside. The short-term rate of global sea level rise has decreased by about 25% since the release of the AR4—and a new paper shows that some 15% of the observed rise comes not from global warming, but instead from global dewatering. In light of all this, rather than raising its projections of sea level rise, perhaps the IPCC ought to consider lowering them once again (as it did from its from its First Assessment Report to its Second, and from its Second to its Third). This document [the IPCC AR4] works very, very hard to be an assessment of what is known scientifically and what is well-founded in the refereed literature and when we come up to that cliff and look over and say we don’t have a foundation right now, we have to tell you that, and on this particular issue, the trend of acceleration of this flow with warming we don’t have a good assessed scientific foundation right now. The IPCC did toss a bone to its skeptics by discussing the potential for “changes in ice dynamics” to “increase the contributions of both Greenland and Antarctica to 21st-century sea level rise” listing basal lubrication in Greenland and loss of glacial buttressing in Antarctica as possible mechanisms. In a back-of-the-envelope type of calculation, the IPCC determined that “if recently observed increases in ice discharge rates from Greenland and Antarctic Ice Sheets were to increase linearly with global average temperatures change, that would add 0.1 to 0.2 meters to the upper bound of sea level rise.” But, somewhat astutely, the IPCC added “Understanding of these effects is too limited to assess their likelihood or to give a best estimate.” I say “astutely”, because in the case of basal lubrication in Greenland, additional research has shown this not to be very effective at producing a large long-term acceleration of ice flow (e.g. Nick et al., 2009), and in the case of Antarctica, modeling work suggests that recent accelerations are not likely to be sustained (Joughin et al., 2010). Such findings have raised a far degree of alarm and resulting in growing pressure for the IPCC to reassess their TAR projections. And waiting until the IPCC Fifth Assessment Report to investigate the topic apparently is unacceptable. And so a movement is afoot to try to sneak some new sea level rise text into one of the other myriad “Special Reports” put out by the IPCC (which typically don’t draw as much attention as the their major Assessment Reports do—but I imagine that would change with the release of a major change in the projected rate of sea level rise). One potential outlet would be the IPCC’s “Managing the Risks of Extreme Events and Disasters to Advance Climate Change Adaptation (SREX)” that is scheduled for release in late 2011 or early 2010. I hope the IPCC resists this urge. In reconsidering its existing sea level rise projections, the biggest thing that the IPCC needs to bear in mind—even bigger than the string of reports projecting a meter sea level rise by the year 2100—is what reality has to say. There are at least three things that nature is telling us that I think the IPCC ought to pay attention to. 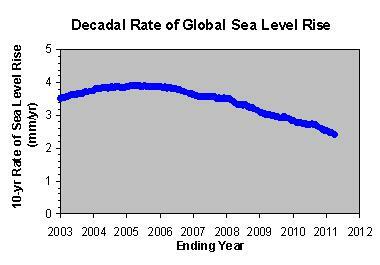 First off, the decadal rate of sea level rise has been decreasing. So if the 3.1 mm per year from 1993 to 2003 were interesting enough to be included in the SPM, then, keeping up with the decadal rate of change should be high on the IPCC’s to-do list. And just in case they have let this slip, I include Figure 1 which shows the progression of the decadal rate of sea level rise as measured by the same source used by the IPCC, from the inception of the data in 1993 through the present. The rate of sea level rise for the most recent 10-yr period is 2.37mm/yr—a drop of nearly 25% from the value last reported by the IPCC. On to number 2. A fair proportion of the sea level rise is not from global warming, but instead is from global dewatering. What am I calling “global dewatering”? The pumping of groudwater for human use, the bulk of which finds it way into the global oceans instead of back into the aquifers where it came from. A new paper by Leonard Konikow of the U.S. Geological Society puts the total annual groundwater removal during the 2000s as ~145 cubic kilometers per year, which subsequently contributes about 0.40mm per year of sea level rise. And Konikow finds this amount to be on the rise (i.e., contributes an ever-growing amount to the rate of global sea level rise). So of the 2.37mm/yr of observed sea level rise, ~0.40mm/yr—or about 15%—comes not from “global warming” but instead from our consumptive water use. Which leaves only about 2mm/yr from climate change—a value which falls comfortably in the range of sea level rise which characterizes the behavior during the 20th century. In other words—evidence for a recent acceleration of sea level rise is entirely lacking. Which brings me to my third point for the IPCC to consider: there is a huge disconnect between current rates of sea level rise and the rate necessary to get to 1 meter by the year 2100. If the global sea level is going to be 1 meter (or more) higher in 89 years, it better get going. As of now, it needs to average 11.23 mm/yr or a rate that is about 5.7 times greater than the current rate to get to a meter by 2100. But, as with most catastrophic climate change projections, there always seems to be an “out” when it comes to trying to use actual observations against wild projections. 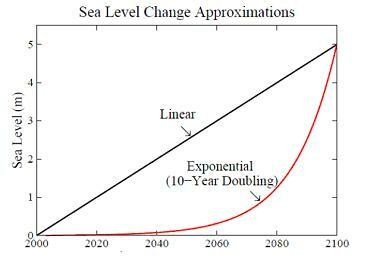 In Hansen’s “multi-meter sea level rise this century” paper, he helpfully includes the figure below (Figure 2), to explain why most of us will be dead before knowing whether he was right or not—instead of a linear increase in the rate of sea level rise, he suggests that it more likely will be exponential and all sneak up on us during the last few decades before 2100. The good old “exponential rise”—an alarmist’s dream. Well, if Hansen is right, hopefully we’ll have figured out a way to deal with it by then. And if he is wrong, then business-as-usual seems to be plenty sufficient to handle what is to come. (Note: in the real world, exponential changes are usually not sustainable). All this to say that the IPCC has its job cut out for it when it comes to reassessing its projections of 21st century sea level rise. The observations are not well-cooperating with the projections calling for a sustained acceleration of the rate of sea level rise leading to a rapid increase in the height of the oceans—in fact, the rate of sea level rise (which itself is the grand integrator of all processes acting upon it, including ice loss from Greenland and Antarctica) was been slowing. Instead of racing upwards, the global sea level is plodding a way along at a rate that that will only produce an additional ~20 centimeters (~8 inches) of rise between now and century’s end. So, instead of the IPCC authors trying to justify a meter or more, it seems like they are going to have to work hard just to defend the AR4 mean value of 39 cm (15 inches). Grinsted, A., J.C. Moore, and S. Jevrejeva. 2009. Reconstructing sea level from paleo and projected temperatures 200 to 2100AD. Climate Dynamics, doi: 10.1007/s00382-008-0507-2. Joughin, I., Smith, B. E., and D. M. Holland, 2010. Sensitivity of 21st Century Sea Level to Ocean-induced Thinning of Pine Island Glacier, Antarctica. Geophysical Research Letters, 37, L20502, doi:10.1029/2010GL044819. Konikow, L., 2011. Contribution of Global Groundwater Depletion Since 1900 to Sea-Level Rise. Geophysical Research Letters, in press. Nick, F. M., et al., 2009. Large-scale changes in Greenland outlet glacier dynamics triggered at the terminus. Nature Geoscience, DOI:10.1038, published on-line January 11, 2009. Vermeer, M., and S. Rahmstorf, 2009. Global sea level linked to global temperature. Proceedings of the National Academy of Sciences, 106, 51, doi: 10.1073/pnas.0907765106, 21527-21532. Basically it confirms the IPCC AR4 estimates. He uses a more physically based way of calculating the Steric contribution than does Rhamstorf, too. Analysis I’ve been doing on Pacific sea-level shows a large effect from the 1997/8 ENSO – a sharp drop followed by a sharper rise. It’s remarked on all the websites I obtain data from. Why were the AR4 authors unaware of this? Data from Australian sites shows this accounts for most of the rise in the second half of the century, and it’s easy to show that graphically. (1) An accelerating model actually makes quite a lot of sense to myself, though I (like you) am not a climatologist. To put simply, ice tends to melt faster in a room that is hotter. Of course, other factors must be considered such as the exposed surface area of melting ice, but I’d want to carefully examine such issues before labeling exponential models as “alarmist dreams”. In my opinion we should not equate computer modelling that show exponential changes in X value over Y period of time with “slippery slope fallacies”. (2) 15% of the sea-level rise is from global dewatering. Great, but how much was global dewatering contributing to previous years? Do we assume that dewatering happens at a sustained rate or has that rate been decreasing/increasing? My guess would be that dewatering is probably decreasing as aquifiers dry up, but this is a guess. But if I were offering critique or peer review, I’d probably want to address this possibility first. (3) We should consider that even though the rate of increase is decelerating, the rate of water being added to the oceans may be linear or even accelerating. If you are filling a V shaped glass, then the amount of water to go from a 4cm depth to a 5cm depth is greater than the amount of water to go from a 3cm depth to a 4cm depth. This is because as water is added, the surface area of the top increases. Since most of our ocean shoreline is more accurately “—”-shaped than “V”-shaped, the effect would be even greater. Of course, this does support the idea that for a large increase, we’d need an exponential model. To conclude my thoughts, it is possible that the deceleration is caused by some combination of (a) reduced dewatering and (b) the rate of melt-off is unable to match the pace of the growing surface area of our ocean in a way that would sustain linear depth increases. Also, exponential growth seems fairly plausible. Of course, assuming you’re assessment is correct and growth is linear (which I’m doubtful of), we still have a problem. Linear growth doesn’t change where we are going, only how fast we get there.